I bought a great dress for the shop and with it was a button up shirt in a matching pattern. I knew right away I had to keep the shirt for myself in order to let the dress make it to a new home. 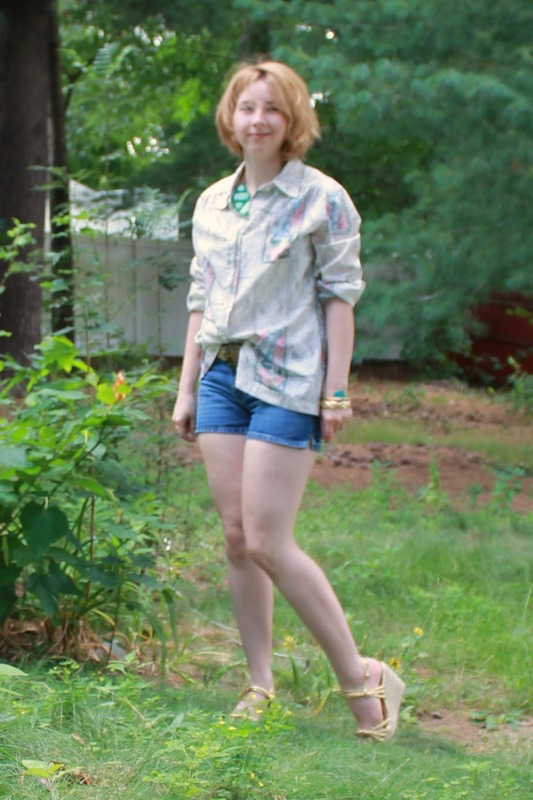 I typically don't wear shorts, despite any heat, and if I do they are usually 5" or bermudas... but these vintage Gap denim shorts have been a staple in my closet for a few years. Maybe once or twice a summer I'll break them out. Most of the time I wear them to the beach, but today I decided to mix them with the mucha-esque button up top. Still trying to get the range right on my new DSLR. I think I'll have to get a remote for it soon. Went with teal and gold accessories to bring out the green in the blouse print. Vintage bangles, and a druzy bangle from a fashion show in Boston. I enjoy the clarity of the grass in this photo. A shot of the matching dress. Isn't the print amazing? Required a lot of TLC to get it vibrant and clean, but it was worth it. A quick brown fox jump over the lazy little dog.